Saturation plugins are a dime a dozen. Most of them just increase the input signal in a few stages, throw a few different EQ curves and there you go… “Color”. Kush Audio eschews the norm and has developed a whole new monster that falls into its own category. UBK Pusher takes saturation and color to a whole new level with several unorthodox controls and concepts, giving you an all-new take on your audio content. Pusher is many things all at once: a hybrid type magnetic EQ, a transient enhancer, distortion box, and a limiter. 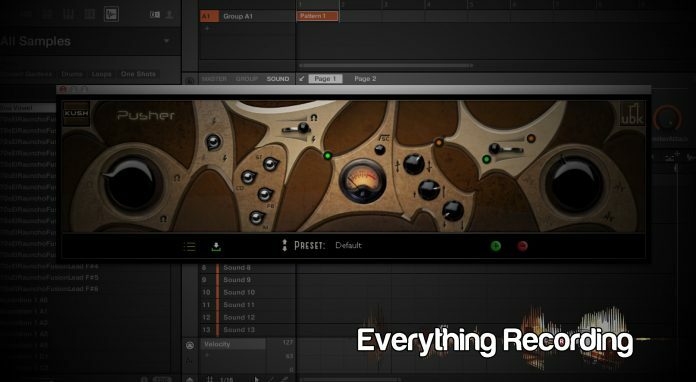 It is available in both 32 and 64 bit versions of AAX, AU, and VST and requires either an iLok 1 or 2. The preset menu has been completely overhauled and rests on the bottom of the GUI. Presets can be easily stored and edited with great ease. Installation couldn’t be easier and trials are easy to get a hold of if you so dare. Upon opening Pusher you will see a rather intriguing interface that probably looks unlike any other plugin you’ve seen. Since there are no outright descriptions of what each control does, the GUI is abstract and inviting to just start turning knobs. Even though this plugin seems to just be a host of strange knobs and sliders, there is actually a method to the madness. This becomes apparent when “cheat mode” is enabled, which sheds light on each control in the form of an overlay with brief but very helpful explanations. So what do they do? The 4 knobs with ST, CO, FE, and NI represent the different types of cores that are present in different hardware preamps. Each of these represent in descending order are “Steel, Cobalt, Iron, and Nickel (get it? The abbreviations are the periodic table signs)” and they all have a very unique effect on the signal. As you increase and decrease the amount of signature in each core, you will notice a change in the overall tone of the audio content. The key to these cores is in how they react to differing amount of each, not necessarily in the use of individual cores. Want more impact of the cores in the source audio? Simple, just increase the big knob on the far left. This will apply more or less of your cores and mold your audio to reflect your newly created combination. Want to beautifully maim your track even more? Sure you do. The knob with the lightning bolts around it is your Bias control. This will multiply the range of the harmonics and will impact your transients. This is perfect for injecting more snap to a snare or extra bite to guitar tracks. It is almost a high shelf EQ in itself if used right. After the audio is charged with all of your magnetic goodness, the content moves to the slider knob slightly above the cores. This will allow you to blend the magnetized signal in with your original, giving you complete control over just how much or little you would like to move on to the next phase. So what do we hate about it? Well to be honest, there really isn’t anything to hate or even dislike, but I wish I could trigger the limiter externally. Other than that, Pusher does brilliantly what usually takes several different plugins to do decently. The amount of control the Kush UBK team has given is immensely freeing. They truly put the experience in your own hands in a way that is conducive to creativity. I found myself placing it on drums quite a bit and even went as far as keeping it in a template for my electric guitars. One of my favorite things to do with it is duplicate a kick drum track and just destroy it and blend it back in. The cores are really chaotic and you never really know what you’re going to get each time you turn the knobs. This makes for some very exciting changes to tracks and can even move the entire feel of the mix. I know I’ve mentioned the extreme portion of this plugin but Pusher can actually behave subtly to just add a nice vibe to the track. I usually will bump the nickel and copper core to 75% and slightly back off the steel on synth tracks for an almost breakup sound. From there I will use the sliders to mix it perfectly in with the original to tuck it away in the mix. I would like to point out that the labeling of the controls, even though hieroglyphic, perfectly display what each control actually accomplishes once you look at them and the layout of this plugin is extremely straightforward. I actually prefer the labeling system over the standard boring controls that other manufacturers use. This plugin really beckons you to just turn knobs to see what happens and that is what mixing is really all about at the core. The presets that are included are great but the real fun is in just moving dials until magic happens. I love Pusher’s approach and find this plugin as fun as it is useful. To purchase and for more information, visit http://www.thehouseofkush.com/#!ubk-pusher/cqir and while you’re there, join the “Pimp Council” for news updates. I don’t say this often, but if you’re going to “like” a company’s Facebook page, like Kush Audio’s page at https://www.facebook.com/KushAudio. Gregory freely doles out some of the most concise and useful information of mixing and audio.